Editor’s note: While at the SHOT Show earlier this year I had the pleasure of meeting Chris Hodgdon, of Hodgdon, the venerable powder manufacturer based in the Kansas City area. Founded by his grandfather after the Second World War, Chris continues in the family tradition, handling a host of the marketing related activities for the company. He sat down with us to talk about what’s new with the company and its growing product line. Q: Tell us a little about yourself and what you do at the company? 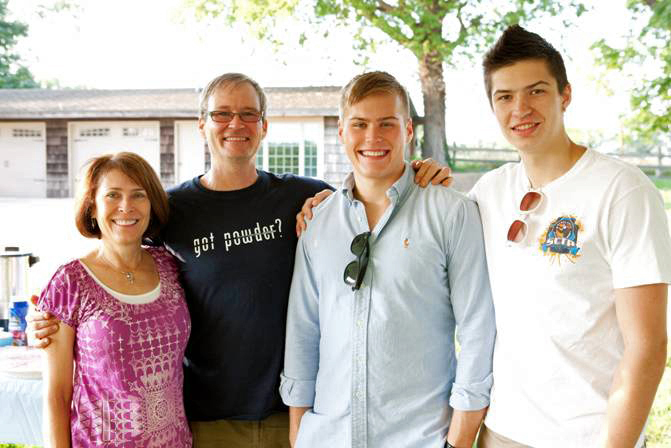 A: I’m the grandson of the founder Bruce Hodgdon and originally grew up in the Kansas City area working part-time packing powder, loading trucks, picking orders for the family business. After graduating college in the mid 80s from the University of Kansas my career path was originally in radio broadcasting, it wasn’t until I was my 30s that there was an opportunity to come back to Hodgdon. I’ve been full-time for twenty-three years now really enjoying my profession within the company (at Hodgdon most of us wear multiple “hats”) doing public & media relations, customer service, marketing and sales. Whatever needs to be done, that’s what we do. Q: Does Hodgdon manufacture its own powders or do you source from OEMs? A: Hodgdon manufactures muzzleloading propellants such as Triple Seven, Pyrodex and Goex black powder. We are marketers for smokeless powders such as Hodgdon, IMR and Winchester brands. Q: How does Hodgdon differentiate itself from other manufacturers? Isn’t powder pretty much a commodity? A: For nearly 70 years we have prided ourselves in listening to our customers to continually develop technologically advanced propellants. We will not accept anything less than the highest standard of quality for all of our family of Hodgdon powders. Q: There still seems to be a powder shortage around the country, at least from my vantage point. Do you see that changing in the near future? A: That is true that mostly for the past eight years there has been a shortage. For the past year the tide has turned, we are meeting demand with 80-90% of our powders. The popular Hodgdon Extreme powders such as Varget, H4350 and H1000 are still highly sought after and we do not see that changing. I suspect that we will have widespread shortages again depending on what happens after the election. Q: Let’s get specific about specific applications for your powders. I heard from none other than Jerry Miceluk recently that his favorite powder for the 10mm is Longshot. I think readers would be interested in your choice of Hodgdon products for specific calibers. I realize that this is a rather broad question but what would your choices be for 9mm, 38 Special, .40, .44 Special and .45 target loads? Any suggestions for target loads in .357, 41 and 44 magnum? Q: What are some of the most frequent questions you get from beginners regarding reloading? A: There are so many questions that we get from new reloaders such as “will I blow myself up?” or “This seems so complex, where do I start?” Reloading is in fact very safe, it’s easy to do, can save you money and the pride of crafting your own ammunition matching it to your favorite gun is well worth it! Just give us a call or email us and we would be happy to get any beginner started. Q: I note that CFE Pistol is new in your product lineup. What niche does this address? A: CFE Pistol covers a nice mix of cartridges (17) from the 9mm Luger to the 45ACP. It’s outstanding in the 380 Auto, 9mm Luger, 38 Special and 40 S&W. 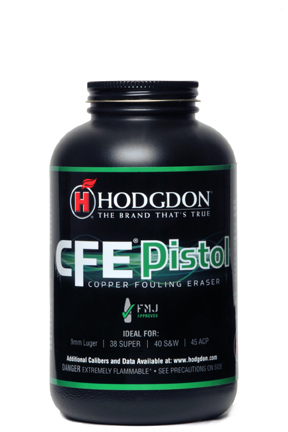 Perfect burn speed for mid to heavy bullets…CFE Pistol has the “Copper Fouling Eraser” technology that vastly reduces or eliminates fouling in handguns even after shooting many rounds through. Q: Back in 1996 you introduced the Extreme lineup of rifle powders which in essence makes the powder consistent across a broad spectrum of temperatures. Thus your point of impact will not be effected by change in temperature. How does your new IMR Enduron enhanced technology fit into this arena? A: Yes that’s correct, it took us several years to educate handloaders on the concept of “Extreme.” The new line of IMR Enduron powders are just as good in the category of temperature insensitivity, in addition as a bonus, we’ve added the CFE technology eliminating copper fouling buildup. IMR Enduron powders come in four different burn speeds that are “clones” to many of our popular Hodgdon Extreme powders including IMR4166 (Varget), IMR4451 (H4350), IMR4955(H4831), IMR7977(H1000). Q: How efficient are the new powders that you’re producing? A: The technology in the newer powders is far different than the older ones. For example CFE Pistol (introduced in 2014) powder is similar in burning speed to HS-6 (introduced in 1963) and it uses almost a grain less of powder in the 38 Special/125 grain bullet combination and it gets 85 feet per second faster! Using almost a grain less of powder AND getting better performance is efficiency at its finest. Q: Anything new in the pipeline? Previous articleHawaii Tax Foundation Does Good Work!